CORPUS CHRISTI, TX - The latest character in Solid Waste Services’ Recycle Right campaign causes twice the trouble. His name is Haz Ben, also known as household hazardous waste. The most common types of household hazardous waste are cleaners, aerosol cans, varnishes, batteries, automotive fluids (motor oil and antifreeze), pesticides, herbicides, and paint. These items not only contaminate good recyclables when placed in the blue cart, but can also create chemical reactions which can cause potential safety hazards for the environment and endanger the health of humans and animals. 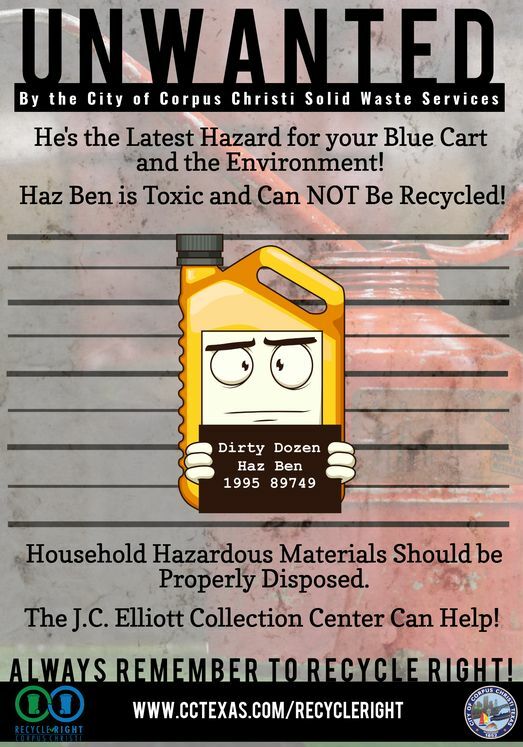 Household hazardous waste should never be placed in the blue cart. These items can be dropped off for no charge at the J.C. Elliott Collection Center, Highway 286 at Ayers Street, Monday through Saturday from 8:00 a.m. to 5:00 p.m. and Republic Services, 4414 Ayers Street, Monday through Friday from 8:00 a.m. to 5:00 p.m. The City’s Recycle Right campaign is designed to inform and educate the public about how and what to recycle. More details are available at cctexas.com/recycleright. The campaign is also used by Communities in Schools to teach CCISD elementary and middle school students about the benefits of recycling. For more information, contact Program Outreach Coordinator Celina Y. Pulcher at (361) 826-1655 or by email at Celina@cctexas.com.